On this page I'll try to keep a record of what homes go on the market, for how long, what they list for, and what they sell for. In addition, I may mention the listing agents and the new owners. If I miss something, or misrepresent something, please let me know about it. The former home of Mrs. Lena Fox, the inspiration for Alfred Uhry's play, Driving Miss Daisy. This beautiful Druid Hills landmark was listed by James Helms of RE/MAX Metro in February of 2000. The white-columned mansion sits on an estate that borders the Chatahoochee River, at the very end of West Paces Ferry Road in north Buckhead. It was listed by Carol Dean Davis with Coldwell Banker in late 1997, I think. This traditional home, located in the exclusive subdivision of Brookhaven, was listed by Wes Vawter with Jenny Pruitt & Associates in the Fall 1996 for $599,900. It was sold in the Spring of 1997. Listed by Estelle Goldin with Remax for $349,000 in early 1996, and sold to Wanda & Bob Klodosky in early 1997. It is located just north of Emory University in Druid Hills. It was originally listed by Patti Junger of Buckhead Brokers in February 1996, and then it was listed by the owner for awhile. As of February 1997, the sign in the yard is Ms. Junger's, and it was under contract. As of July 1997, there was no sign. The house has undergone major renovations including, among other things, additional bedrooms. 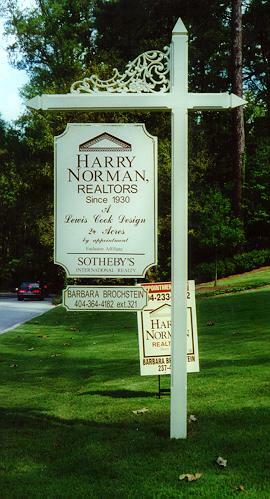 It's located in Brookwood Hills, in south Buckhead.